If you're an English speaker and/or writer, and have allowed your grammar and/or punctuation to slip, this little book will help you get back on track. For many of us, what we learned at school seems so distant and every now and then (I speak for myself), one needs to check one's correctness when it comes to getting ideas across or putting ideas down on paper - especially if it's to be read by others. This great book is divided into two parts: Parts of Speech, and Punctuation. You'll be taken through Nouns, Pronouns, Verbs, Modifiers, Commas, Quotations, Brackets, Braces, and Parentheses, and so much more. 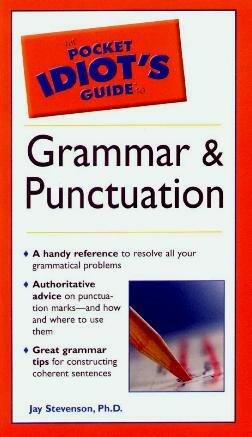 They have included a Grammar Glossary, a Common Grammar Problems appendix, and a regular index for quick reference. Something I find infinitely annoying is the misuse of an apostrophe. This book will help you write and speak better English, and thus, be better understood. So much "bad language" goes uncorrected so it's no wonder people speak so badly. I know I would have trouble distinguishing my conjunctions from my subordinating conjunctions! Conclusion - I'm going to get a lot of use out of this book, especially when I write.